I just spent the past two days climbing Platte Clove in the Catskills. The big waterfalls are finally starting to form, and many of the regular lines are in great shape. Surprisingly, if you were able to get out of the wind it was not so bad out there. Here are a few photos from the past two days. 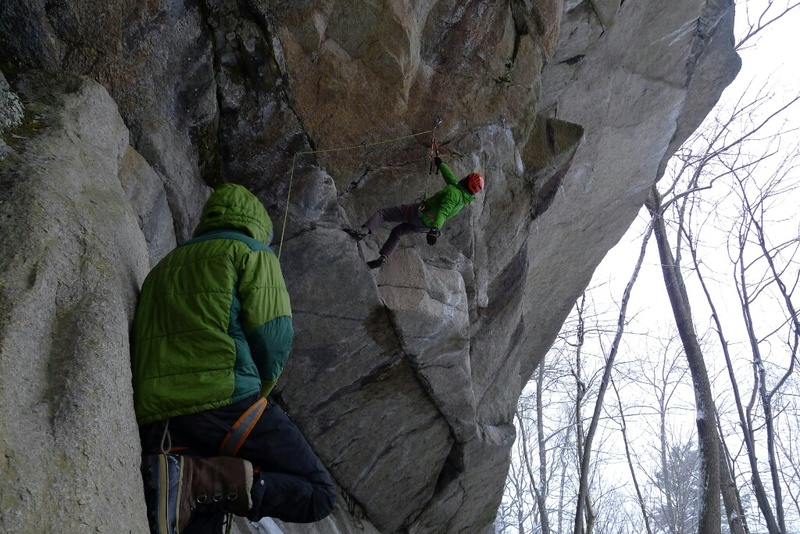 In addition to running Valley Vertical Adventures, I work for Mountain Skills Climbing Guides, based out of New Paltz, NY. Doug Ferguson, the owner there, provides me with work to fill in the holes in my schedule, and allows me to work for Mountain Skills so that I can continue to guide in the Shawangunks, where access to permits is both challenging and slightly political. Last Saturday I had a wonderful day of ice climbing at the North Face of Pitchoff in the Adirondacks with two of Doug's regular clients, Andrei and Galina. Andrei and Galina have climbed a lot of mountains in western Canada and the Pacific Northwest. Originally from Russia, they took up climbing after they moved to the United States 14 years ago. Since then they've climbed Robson, Rainier, Shuksan, Athabasca, Andromeda and others. However, they'd only ice climbed two times prior to last Saturday. However, if Saturday, their third day of ice climbing, was any indication this couple is physically fit, determined to succeed and unafraid of falling. They will be ice climbing very well before too long. While navigating significant crowds we still managed to climb four classic routes and nearly 700' of climbing at the North Face of Pitchoff - Hammond Egger, Tendonitis, Arm and Hammer, and Moss-Ghyll. Thanks Andrei and Galina for a fun day in the Adirondacks! I've coreshot or significantly nicked several ropes this fall and winter. Initially it really pissed me off. I felt like I wasted a lot of money (in one case I truly feel like I did) on gear that really isn't worth buying. Mostly though, it's helped me think about what type of rope is appropriate for daily use and when I need to be really careful about protecting my rope so that it lasts as long as possible. ALL of the ropes that I've had in the 9.0mm range have not been durable. This should come as no surprise to anyone at all. However, the complete and utter lack of durability of some of these ropes leaves me wondering whether they should be sold at all. It seems distinctly possible a rope this skinny could sever during a big fall or while sliding over an edge. The Sterling Nano is the least durable rope I've ever owned. Don't get me wrong, Sterling produces some nice ropes, but many of their Fusion series ropes are just too soft. I've had two Nano's so far, and both received coreshots and significant wear during what I would consider normal use. I nearly severed one during a rappel this winter. It was the rope's first use, and it left me wondering whether I should even bother using the rope again. I had one Mammut Serenity 8.9 mm as well. It has held up slightly better, but it has countless nicks in it's sheath. The 8.9mm Serenity feels slightly thicker than the 9.2mm Nano. Either way, a rope this skinny isn't going to hold up well for most people. I've also heard (hearsay only) that the purple Nano is actually built differently than their other colors and is more durable. I'm not sure what that means, but it might be worth buying a purple Nano if you decide to pull that trigger. Stepping up in diameter, I've used both the Mammut Revelation 9.2 and the Sterling Ion 9.4. Both of these ropes feel far more durable than their skinny brethren. Each of these ropes has lasted nearly a year with light use (whereas a single long day or a single trip will trash the Serenity or Nano). The Revelation was actually one of my favorite ropes, and I used it for nearly an entire winter season while cleaning and working routes in the Hell Hole during the 2010-2011 winter. The next step up in diameter durability for most manufacturers is to the 9.5-9.8 millimeter range. I've used both the Mammut Infinity 9.5, my favorite rope thus far, and the Sterling Velocity 9.8. While I've had good luck in the past with both ropes, This fall I nicked or coreshot two Sterling Velocity ropes rather quickly. One was absolutely my fault, yet I was still surprised by how quickly it happened, The other incident , during the rope's first use, involved several nicks during normal toprope wear and tear that a rope of this diameter should hold up to. Both were less than three weeks into my ownership of the rope, and with less than a week's worth of climbing on each. I've only really used one rope over 10mm in diameter - a Sterling Marathon Pro. It's a burly rope and I've had several of them. If used occasionally they'll last several years before they begin shedding lots of fuzz from the sheath. The Mammut ropes over 10mm always felt a bit too stiff to manage, especially once they begin to freeze. Here are some of the conclusions I've drawn about ropes over the past few years. The skinniest single ropes are too skinny for daily use, and probably too skinny for any sort of rock or alpine use. I know there are people that will disagree with this, but when your safety and the success of a big alpine trip rely having a full-length intact rope, sizing up just a bit seems like a wise decision. The weight difference between a 60-meter Sterling Nano and a Sterling Ion is only 240 grams, just slightly more than half a pound, yet the durability of the Ion is much, much greater. In addition, you'll replace ropes less often meaning you'll save money in the long run. Mammut ropes always feel fatter than Sterling ropes. The Mammut 8.9 feels fatter than the Sterling 9.2. The Mammut 9.2 feels fatter than the Sterling 9.4, and the Mammut 9.5 feels like the Sterling 9.8. Mammut ropes generally feel stiffer than the comparable (see my conclusion above) Sterling rope. Mammut ropes always feel short. Sterling ropes always seem generously long. In fact, if you're going to buy a Mammut rope you might consider buying a 70-meter model. Many of the Mammut ropes I've had end up being as much as 10 meters short by the end of their usable life. Mammut attributes this to shrinkage, I'm not sure I buy this explanation and will hold off on my own explanations. I've had really good luck with the Mammut Revelation 9.2, the Mammut Infinity 9.5, the Sterling Ion 9.4 and the Sterling Marathon 10.1. The Sterling Nano 9.2 is, in my opinion, utter garbage. Not only is it expensive, it's the least durable rope I've ever owned and I'll never buy another one. I've had several Sterling Evolution Velocity 9.8 ropes with varying degrees of success. If you buy one of these ropes you might try to baby it at first, as this rope seems to stiffen after a few weeks of use, and then feels a bit more durable. Initially this is a soft rope that handles nicely but also nicks easily. Kind of a crapshoot if you ask me. The Sterling Marathon 10.1 and Mammut Infinty 9.5 are both good choices for every day rock climbing use, but won't slide easily through an ATC Guide or Reverso in autoblock mode, especially once they've been used for a while. Consider using a Kong Gigi as an autoblocking belay device instead. Dry treatment is fleeting. I've been able to use non-dry ropes for most winter days. If it's really going to be wet I'll grab a dry rope. This way, I can preserve the dry-treated rope for really wet days. I hope this helps you during your next rope purchase. Here is a detailed synopsis of the events surrounding the avalanche in Central Gully last week. The analysis at the bottom has some valuable information about why things went wrong for the group up there. I'll refrain from making comments about the event; suffice to say the desire to have a successful climb, which was for a very honorable cause, likely clouded their decision making ability. The Cathedral Ledge Cave Wall is a great spot for a drytooling session. No ice involved in this mixed climbing, just pure, solid granite clip-ups. Chris Beauchamp and I met up with Silas Rossi and Peter Doucette for an afternoon session this past Wednesday. Here are some shots of Team Green, Silas and Pete, on The Devil Made Me Dog It, M8. Danielle and Serge are headed to Aconcagua next month with Field Touring. 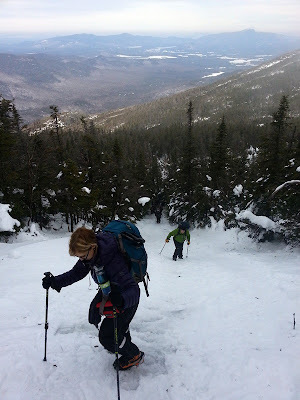 In anticipation of their trip we headed to the Adirondacks for some alpine preparations. 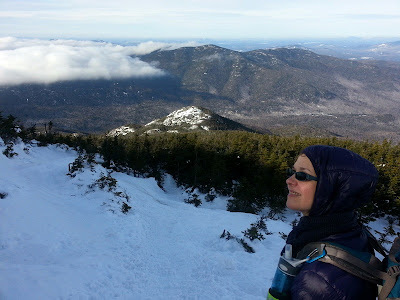 Our two-day trip had us climbing Kilburne Slide in Wilmington Notch on day one and hiking Mt. Algonquin on day two. 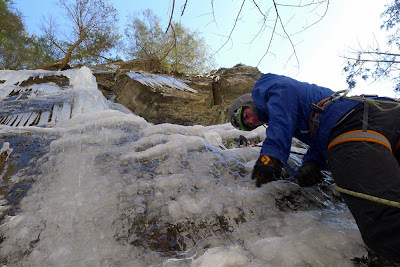 Kilburne Slide, a mellow low-angle slide in Wilmington Notch, is a great place to learn how to use crampons and an ice axe. Here climbers can wander all over the slide learning how to use the crampons on slightly steeper snow and low angle ice. Because the slide is low angle, there's really no need for a rope, and ever the steeper ice bulges are short with nearly flat landings at the base. It's a good spot to take some risks and learn how well crampons will hold in icy and snowy conditions. We did just that, and, due to the warm weather, also managed to trudge through quite a bit of wet snow along the way. An early start on day two allowed us to climb Mt. Algonquin, the second highest peak in the Adirondacks and NY state. The 8-mile round trip hike gains 3,000 ft as it ascends from Adirondack Loj at 2000' to the summit at 5100'. This gain is similar to the largest gain found between camps on Aconcagua and was intended to give Serge and Danielle a feel for the effort involved in getting from one camp to the next during their trip. Thanks Danielle and Serge for a great two days. Best of luck with Aconcagua! I've known Michael Wejchert for several years now. He's a trusted partner, a great friend, and a budding northeastern hardman. When I first met him he soloed a lot. He reminded me of myself when I was younger - at a loss for partners yet dying to gain the valuable experience necessary to climb bigger and harder objectives. The difference between Michael and I was that he was able to convince himself that soloing harder routes felt safe. He's soloed the Dike more times than I can count, and he's soloed the Last Gentleman at Lake Willoughby. Nowadays, as a local climber in North Conway, he has his choice of partners and many of them are North America's finest alpinists and winter climbers. He solos less and climbs hard routes on a rope with good friends more frequently. In this blog post, at his blog Far North Climbing, he shares his story about the time in his life when he soloed a lot. I enjoyed his multi-perspective view of soloing immensely. I'm grateful for his partnership and I'm thankful he's still around to tell this story. Enjoy. Most major climbing areas have at least one route that climber's will agree is an absolute classic. This route frequently epitomizes the climbing style found at that particular climbing area. 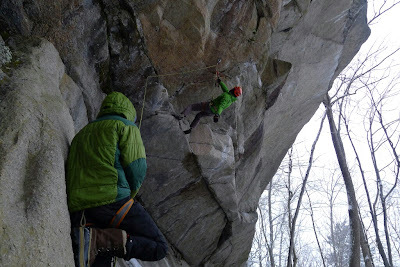 Climbs like Positive Thinking at Poke-O-Moonshine, Called on Account of Rains at Lake Willoughby, and Repentance at Cathedral Ledge all climb unforgettable, striking features. 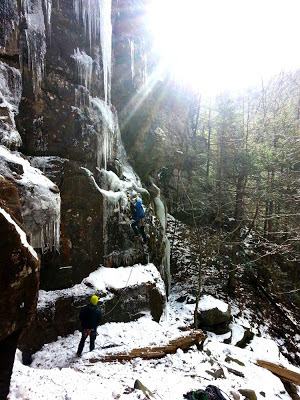 The Catskills are predominantly a cragging area, with mostly single pitch climbing. the Steep sandstone found throughout the area breaks mostly in vertical planes, making nearly every ice bulge, no matter how short or long, completely vertical. Steep climbs here are relentlessly vertical, and the climbing rewards climbers with strong technical skills. Without good technique it's hard to find rests on many of the harder routes. 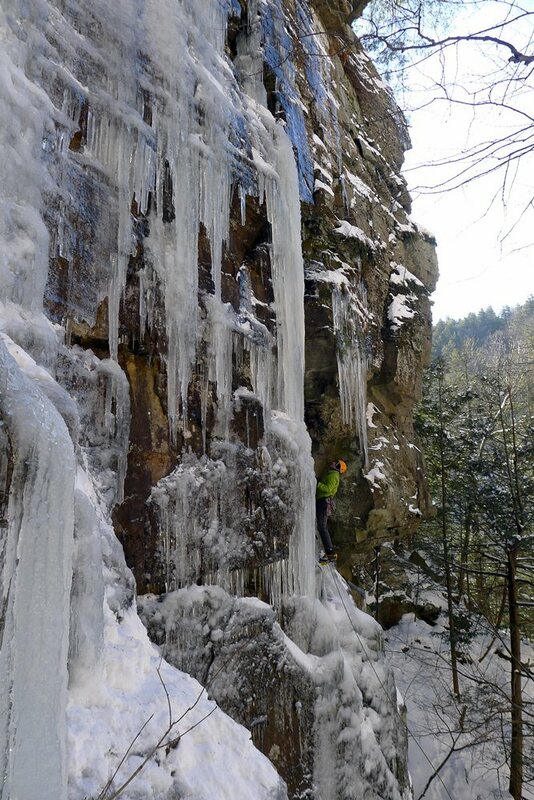 If I was to select one route that epitomizes Catskill ice climbing it would undoubtedly be Purgatory in the Hell Hole (called the Devil's Kitchen in the 2nd edition of the Molitoris guide). 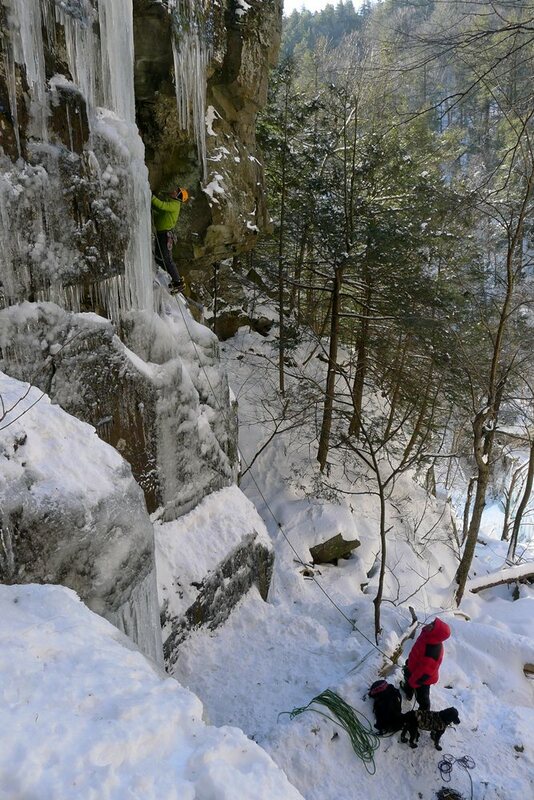 This route involves steep ice, thin ice, moderate mixed climbing and fantastic position along a steep face in one of the most rugged ravines on the east coast. Joe Szot lead this route using traditional gear, and it took him several hours to complete the 90' tall line. It's hard, and leading the route on gear requires the right conditions and a cool lead head. The route saw several subsequent gear-protected ascents by climbers like Kevin Delaney and Lucho Romero (there were others but I don't have their names). Kevin retrobolted the route without Joe's permission at some point later on. I'm not interested in starting a discussion about retrobolting without first ascensionist's permission here; suffice to say it's not an acceptable practice. The bolts have changed the character of the route but not it's quality. Purgatory remains one of the finest single pitch routes in the northeast. 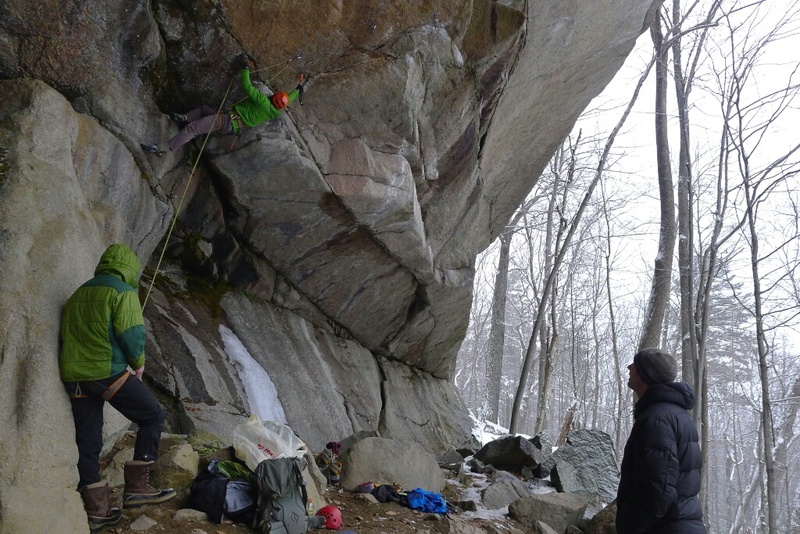 It's a popular toprope for many weekend climbers, but a lead of Purgatory still feels hard and it's a proud tick for most aspiring Catskill climbers. For these climbers wanting to climb harder mixed and ice lines in the Catskills, it's a rite of passage, a gateway to the fine harder climbing found throughout the region. Earlier this season, as I stood in the thin ice face crux of Purgatory working hard to chip the bolts out of the ice, I thought about Joe leading this line for the first time. He must have climbed back to the safety of the alcove rest many times before committing to the crux of this route. As I reached a few bigger pillows of ice that swallowed my picks more completely I thought about Joe again. He must have been relieved to stuff a .5" cam in the crack on the right and toss a sling over the tree that used to grow out of the crack here. He must also have known that he had things in the bag at that point. Silas Rossi, a well-traveled guide who recently relocated to the Hudson Valley spent a day climbing with me in the Hell Hole last week. During the visit he commented that if one encountered Purgatory-like climbing on a bigger route with traditional protection it would probably be rated WI6-. With the bolts we're happy calling WI5-, M5, and it's a relatively safe lead. So, the next time you visit the Catskills give this route a try. It's sure to warm your forearms and put a smile on your face. Here's a gallery of beautiful images of Purgatory from earlier this season. It finally feels like winter in the Catskills. There's almost two feet of snow and most of ice routes are now getting climbed. I've been able to put 5 days in there since last week, and it's been great to climb in such an awesome area, especially after our dismal winter season last year. Here are some shots from the past few days.